I love fall. Aside from the occasional sniffles, it is a time of year where nature exposes its colorful side. Sure, there are flowers in the spring (which I love too), but there is something magical about the way green leaves suddenly turn vibrant shades of yellow, orange and red. All the colors prompt me to venture into the crisp air in order to capture this brief period in the season –similar to a modern day Impressionist. I desire to photograph the leaves, press them in books (for future collages) and paint landscapes – all at the same time. I often find my mind overflowing with creativity. There are 13 days left to celebrate National Arts and Humanities Month, let’s finish our celebration with vigor! Savor the harvest. This is the time of year for simmering soups, fresh-baked bread and a bountiful apple crop. Here is a family favorite — my mom’s apple pie recipe. My favorite part is the topping! She used to guard fresh pies from my picking hands when I was in high school. Preheat your oven to 375°. Combine the sugar, flour and cinnamon in a large, microwavable bowl. Add apples and mix thoroughly. Microwave on high for 1 minute and then stir the apple mixture. Microwave and stir again. Depending upon the crispness of your apples, you may need to repeat the microwaving/stirring one more time. You apples should be softened and a syrup should have formed in the bottom of the bowl. Place the apple mixture in the piecrust. Combine all of the ingredients. Using a pastry blender (or a large fork), work everything into small clumps. Then pour over the apples and spread evenly. Bake at 375° for 30 minutes or until the topping is slightly browned. Resist the urge to consume until it has reached a safe temperature. Decorate! Instructables is one of my favorite “how to” websites. You can search for decoration ideas by theme or materials. Also, it currently has an entire section dedicated to Halloween with instructions for creepy treats, jack-o-lanterns, and of course, costumes. Visit a pumpkin patch. Who doesn’t love wandering through long rows seeking the perfect shape and size for your design needs? Here is a website that lists Kentucky patches by county. 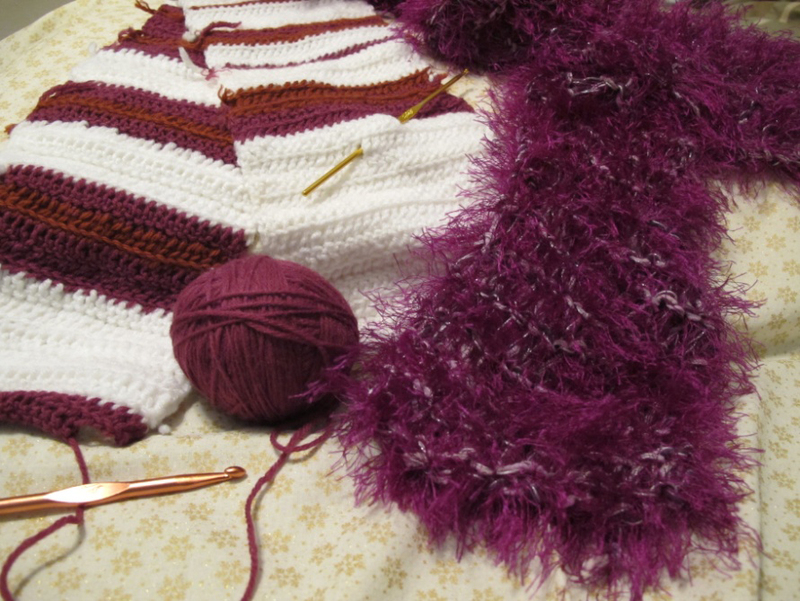 Start knitting or crocheting your winter scarves and mittens now – the cold weather will be here before you know it.